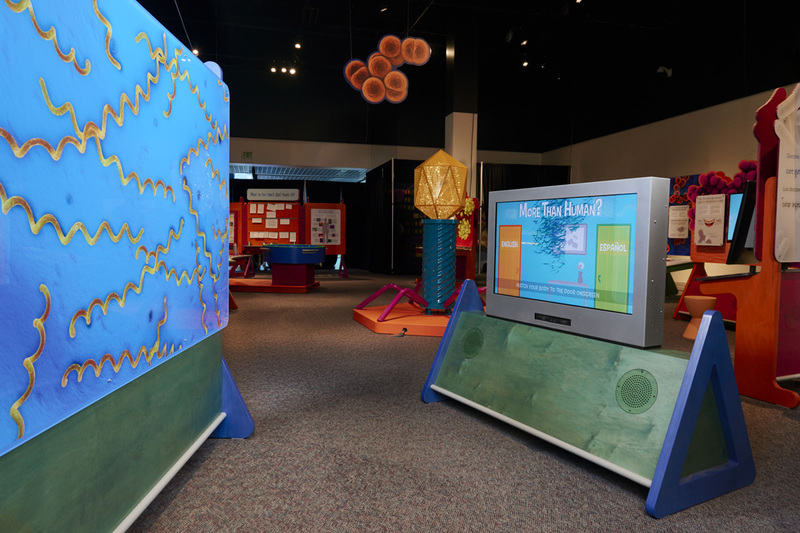 Did you know trillions of microbes make their homes inside your body? In fact, these non-human organisms outnumber our human cells 10 to 1 and “colonize” us right from birth! 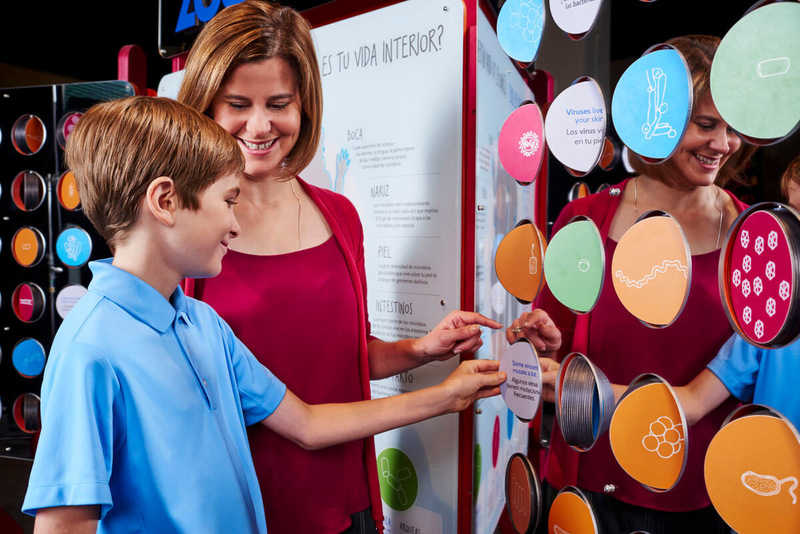 Zoo in You offers visitors fun, interactive ways to learn about the human body’s constant microbial companions, where they live, how diverse they are, and in what ways scientists are realizing just how important they are to overall health. 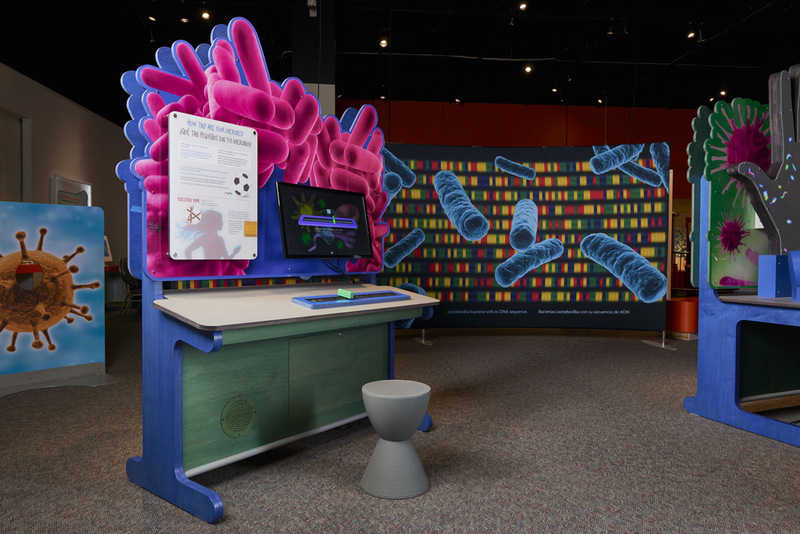 Visitors come face to face with full-body microbial reflection at the Kinect-style Microbe Mirror and navigate a tilt-table maze to learn how a newborn baby is first colonized by microbes. 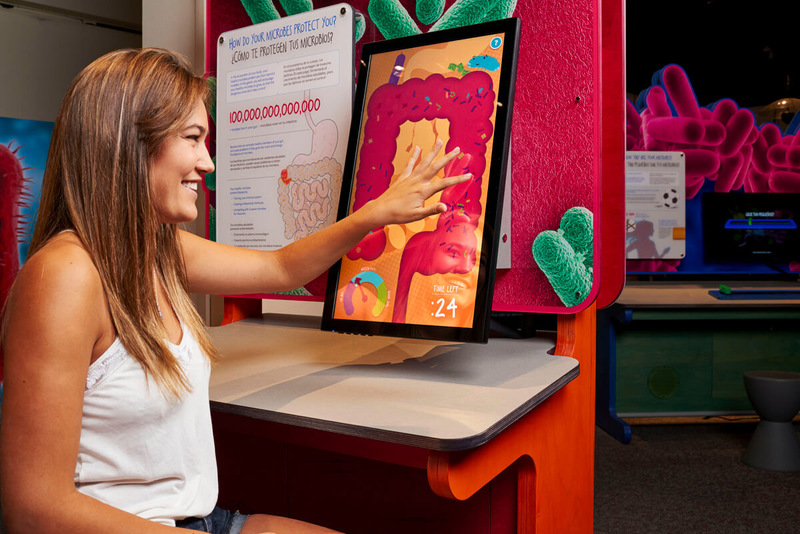 Hands-on components with green screen technology let them give a “weather report” on the current conditions of their nose, mouth, gut, or skin. 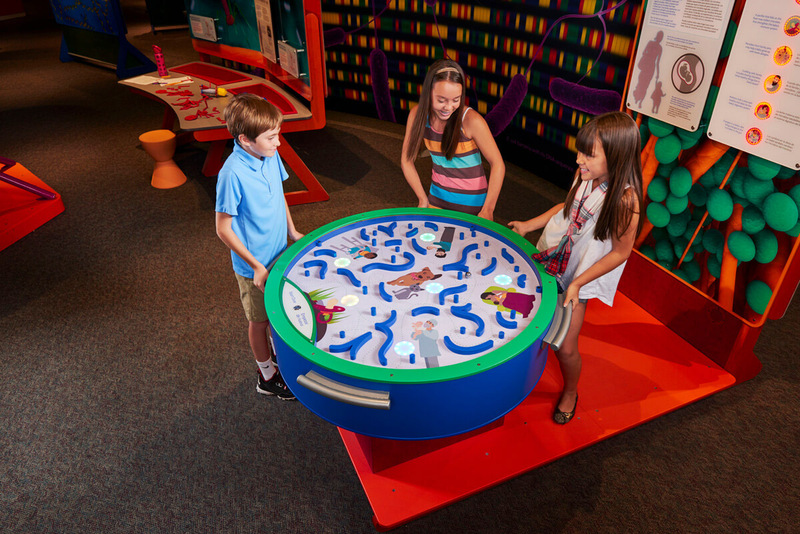 Whether it’s racing against the clock to reconstruct a DNA puzzle, peering into a microscope to see real preserved microbe specimens, or discovering the four major kinds of microbes (bacteria, archaea, fungi and viruses) visitors get up close and personal with Zoo In You. 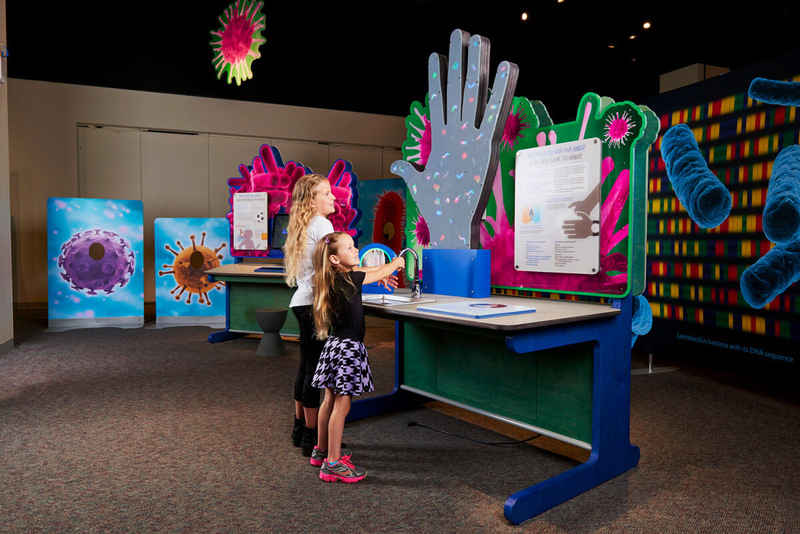 What’s Your Inner Life Like?—In this introductory exhibit, come face-to-face with the fact that you are made up of tiny organisms as you see yourself reflected in two mirrored panels covered by 48 small colorful microbe disks. What’s Your Inner Life Like?—On the back side of "What’s Your Inner Life Like? 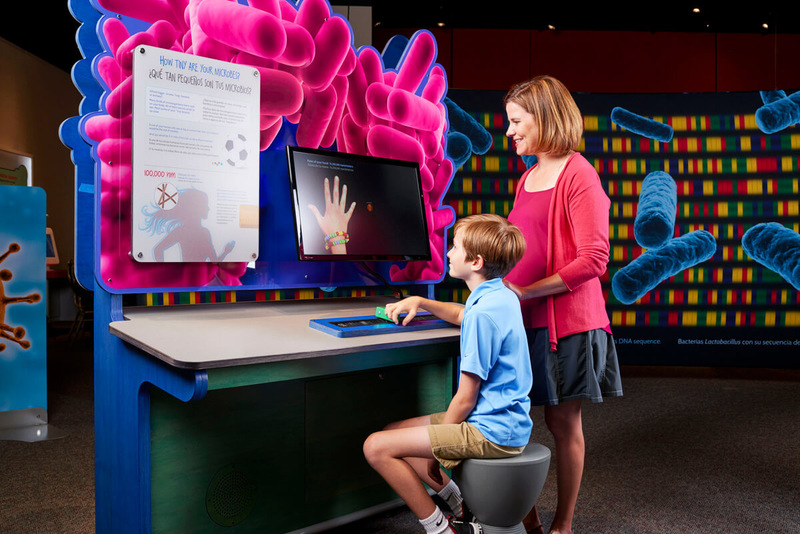 ", you can read various news articles about surprising new insights on current microbiome research. 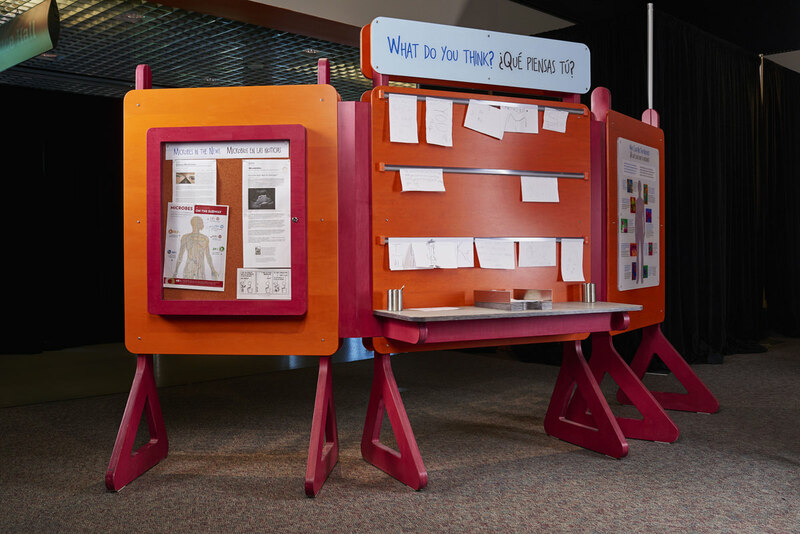 In addition, you can also contribute creative ideas to share with other visitors on a talk-back board. What Would You Do?—Would you donate your poop to science? Vote on different scenarios and find out if most people agree or disagree with your choice. 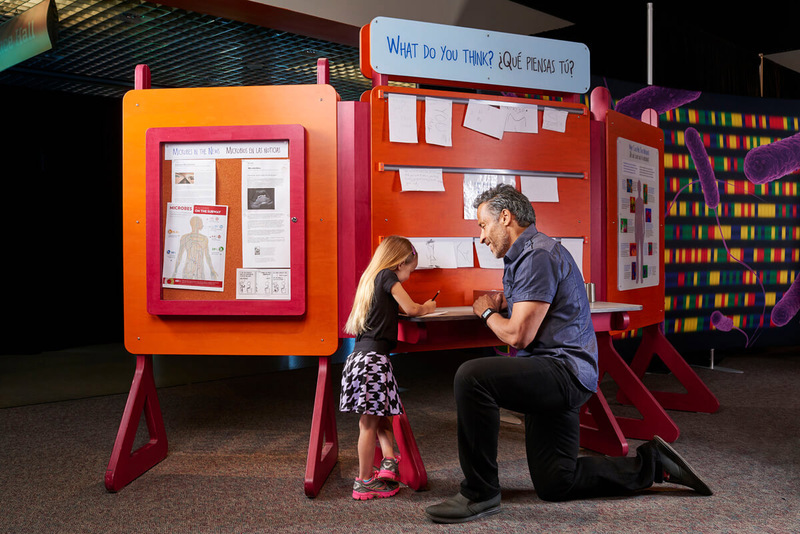 Choose one of three stories by tapping the touchscreen and answer a yes-or-no question based on your personal values, attitudes and cultural influences in everyday life situations. 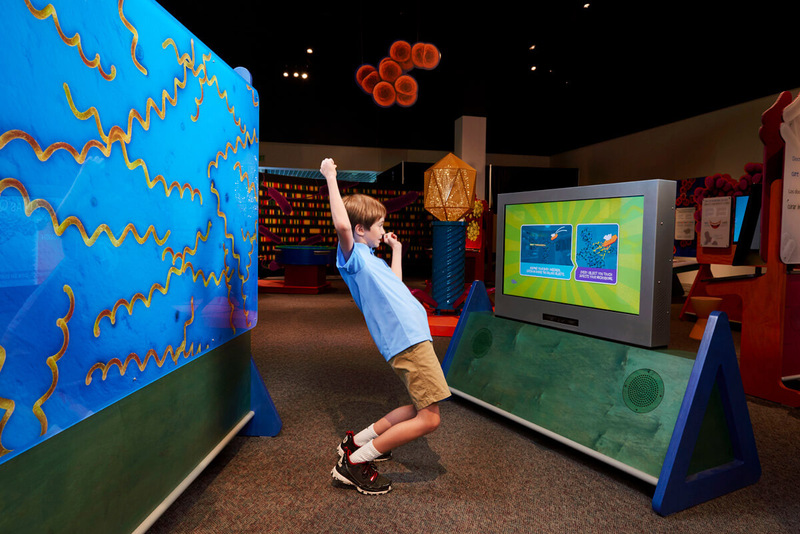 How’s the Weather Inside Your Body?—Interact with green screen technology to deliver a “weather report” on the climate conditions of the different micro-habitats of the human body. 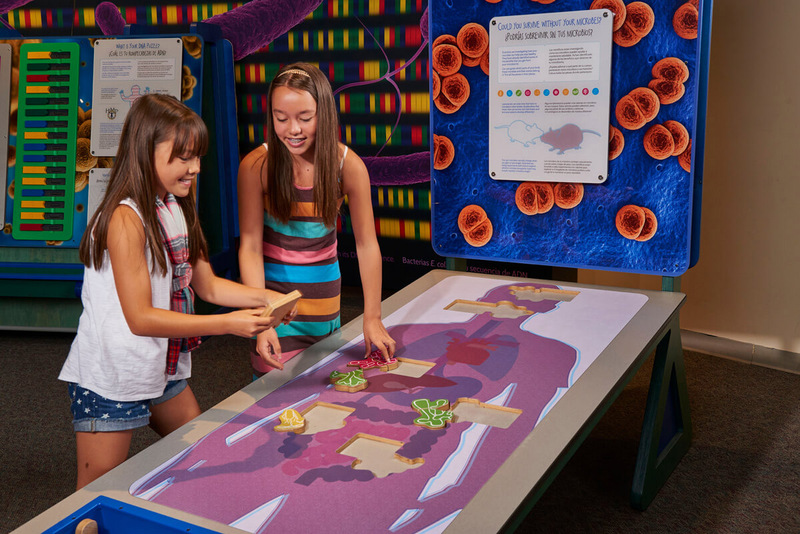 In this full-body activity, you’re the expert reporter, telling the world what it’s like inside certain body areas. 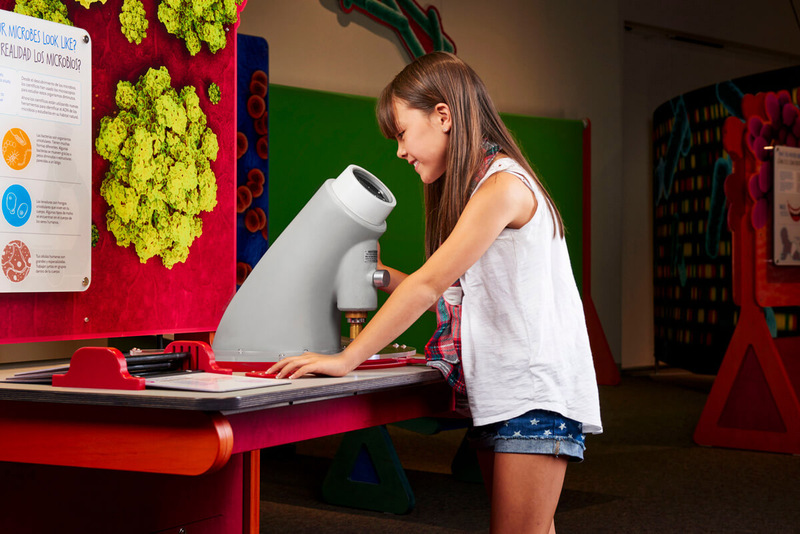 How Tiny Are Your Microbes?—Zoom down to the microscopic level and explore how much smaller our microbe companions are than our own human cells. 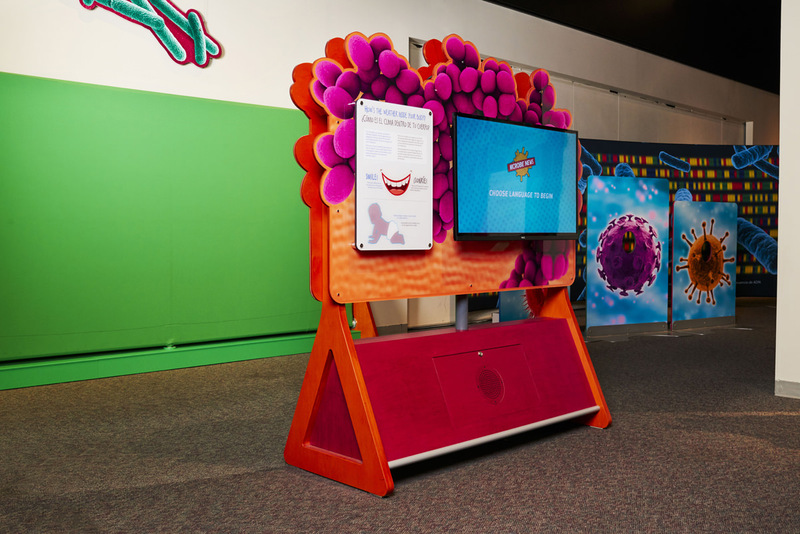 Move through 3-D images of a human blood cell and then further down through a selection of our “normal flora” (fungi, bacteria, archaea, and viruses) to get a sense of the different sizes and structures of the microbes in our bodies. 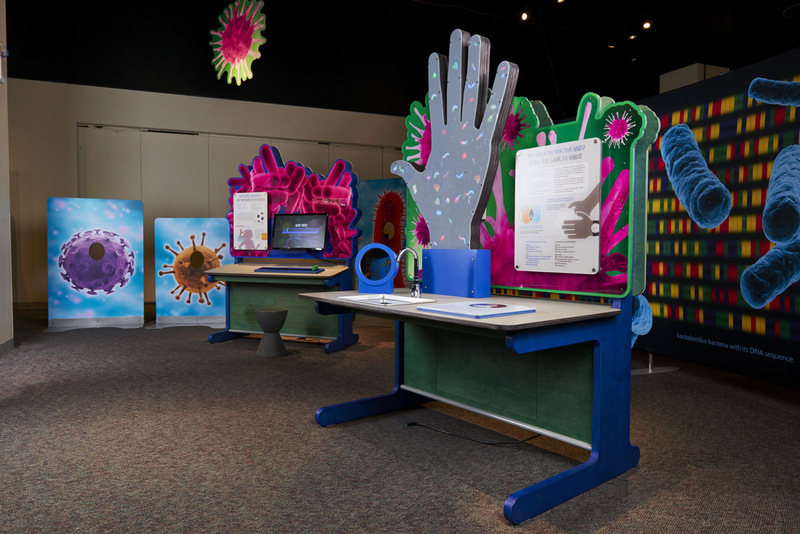 Overview of Zoo In You featuring large, colorful environmentals, photo ops, "How Tiny Are Your Microbes? ", and "How Should You Wash Your Hands?" 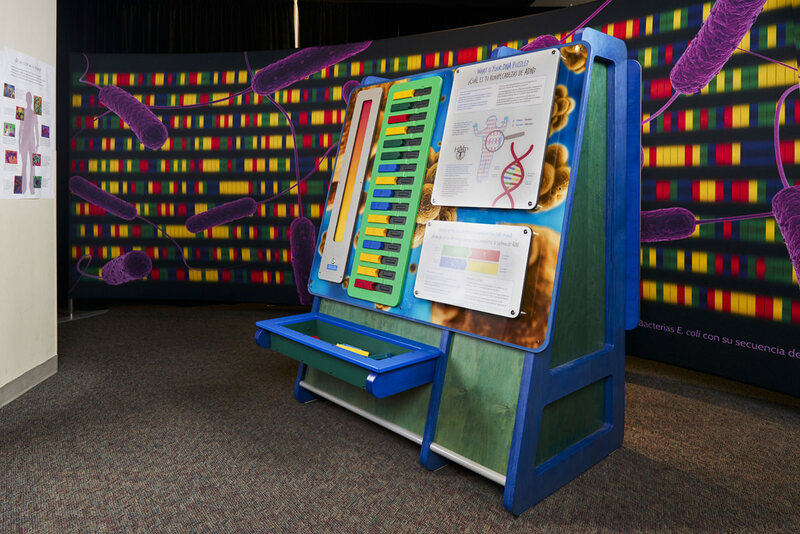 What Is Your DNA Puzzle?—Now you can play the role of the sequencing computer in a much slower, but fun, simulation of what those machines do. 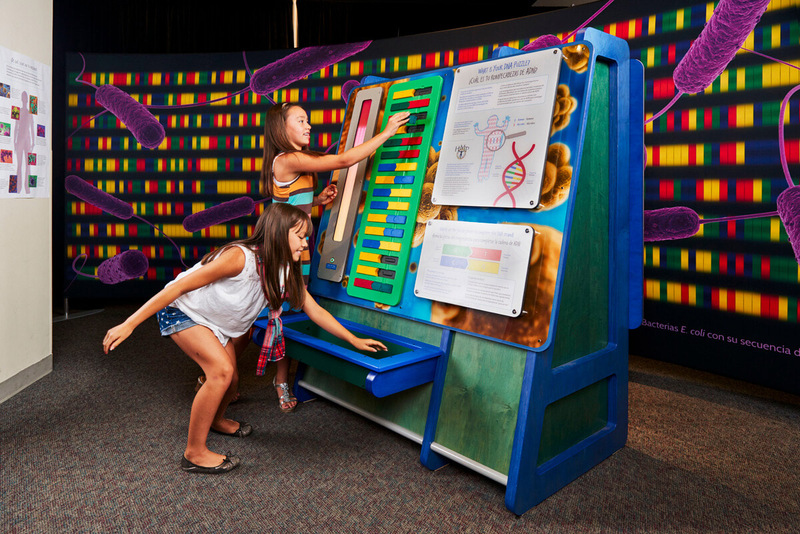 In this activity, you’ll race against the clock to see how fast you and your friends can assemble a puzzle of a DNA strand. 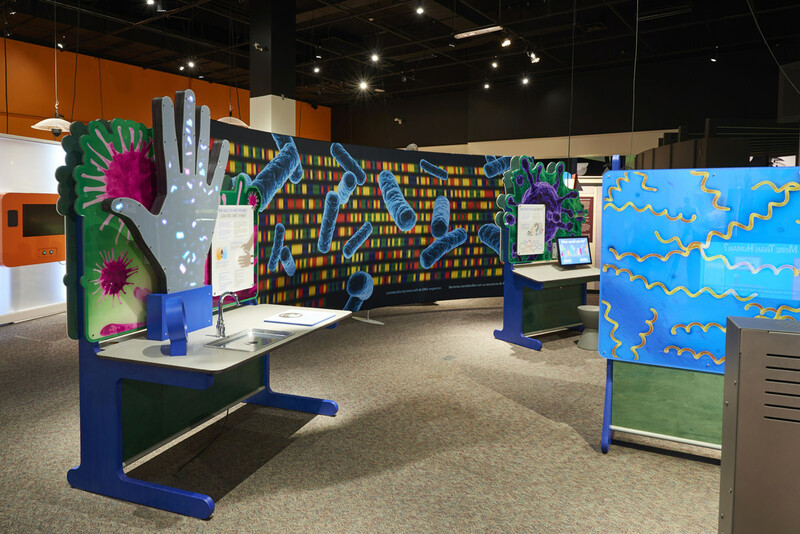 Are You More Than Human?—See your microbial reflection in this full-body Kinects-style game and watch as your personal microbiome reacts to everyday occurrences. 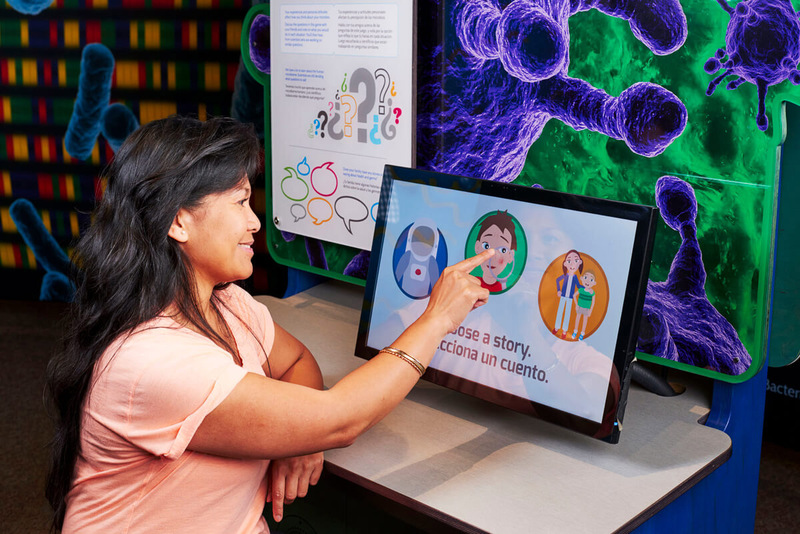 A large screen mirrors your movements as tiny dots and squiggles that represent your microbiome (the sum of all the microbes living in your body). 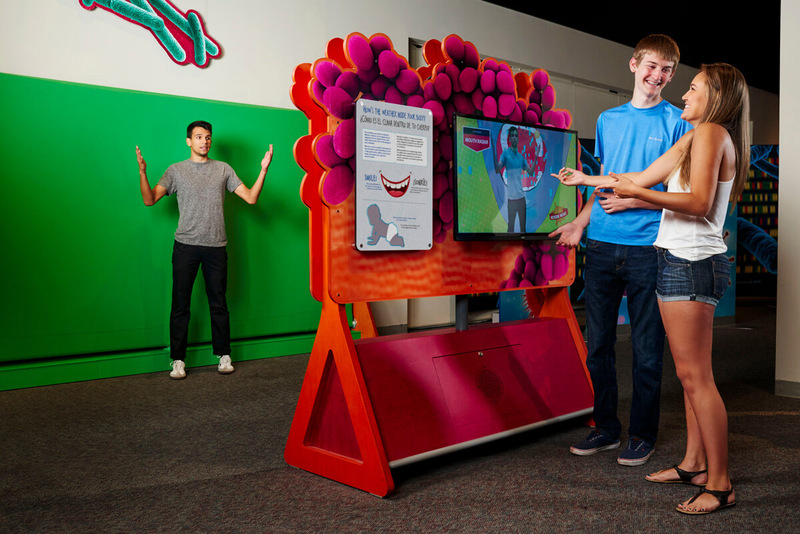 As you move around, waving, jumping, dancing, etc., your microbiome-avatar moves with you. 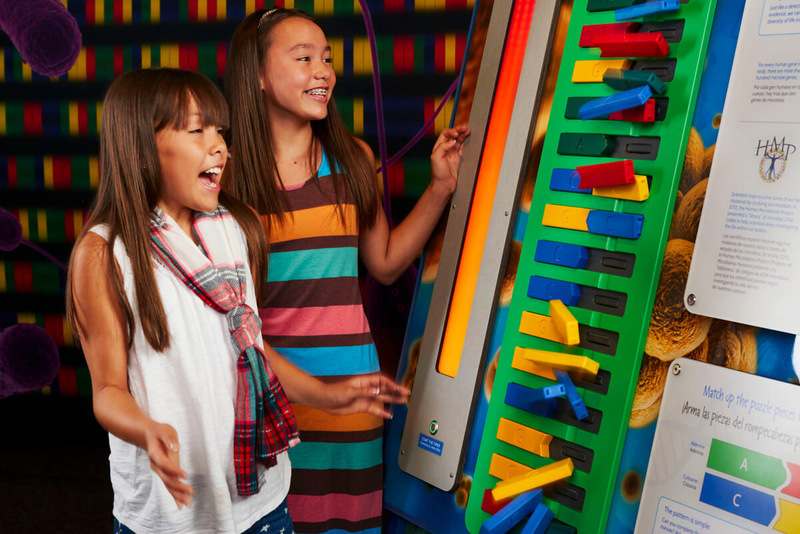 Where Did Your Microbiome Come From?—In this challenging full-body activity, up to four players work together to tilt a table in different directions, guiding a ball into six targets as quickly as possible in the allotted time. Each target represents a way in which a newborn baby builds its microbiome. 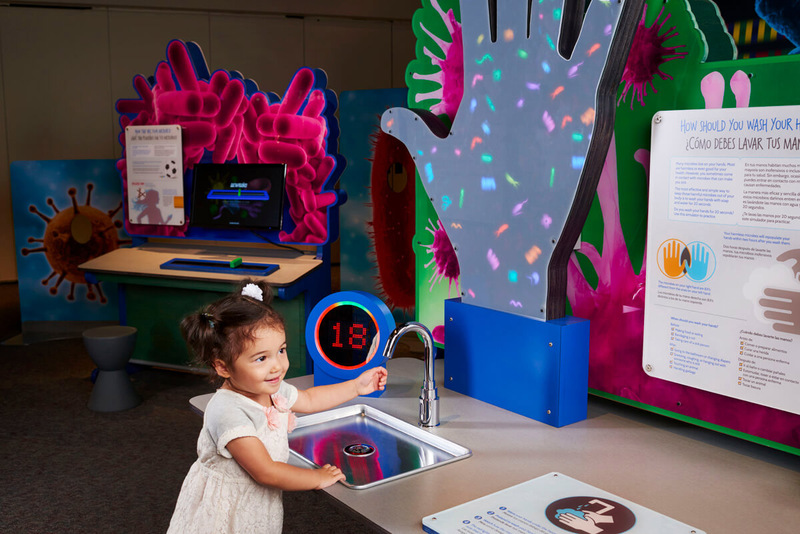 The goal of the game is to “collect” the microbes that will help build the baby’s immune system, by hitting all six targets. 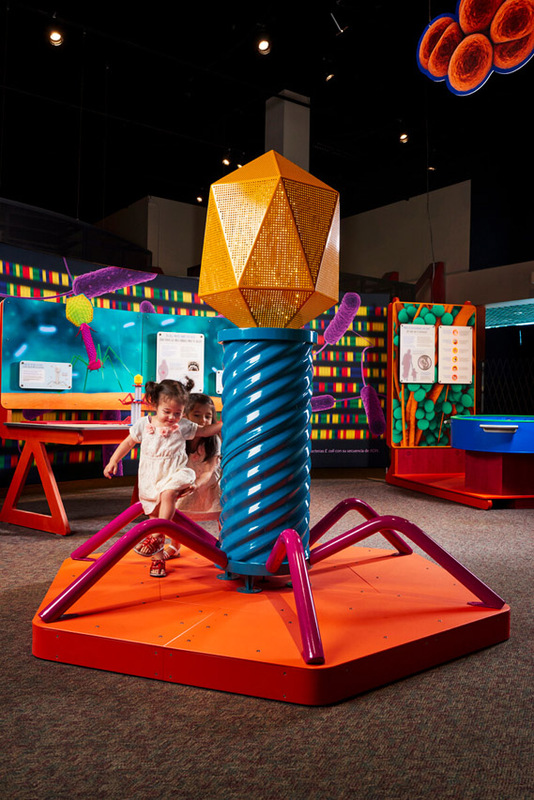 Do All Viruses Make You Sick?—With a gigantic sculptural bacteriophage virus towering in the center of this creative activity, you are challenged to assemble your own smaller virus using various head, body, base, and fiber puzzle pieces. 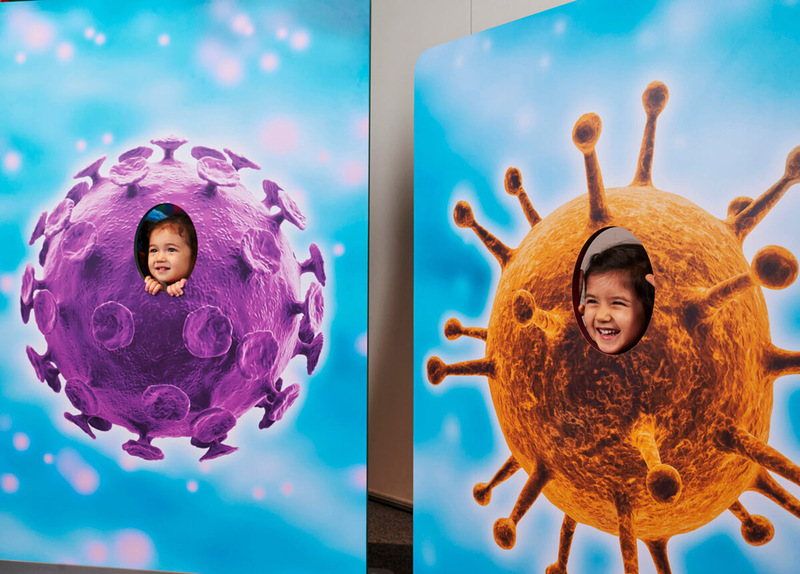 You can either create a virus that matches the giant model, or invent a new mutant configuration of your own. 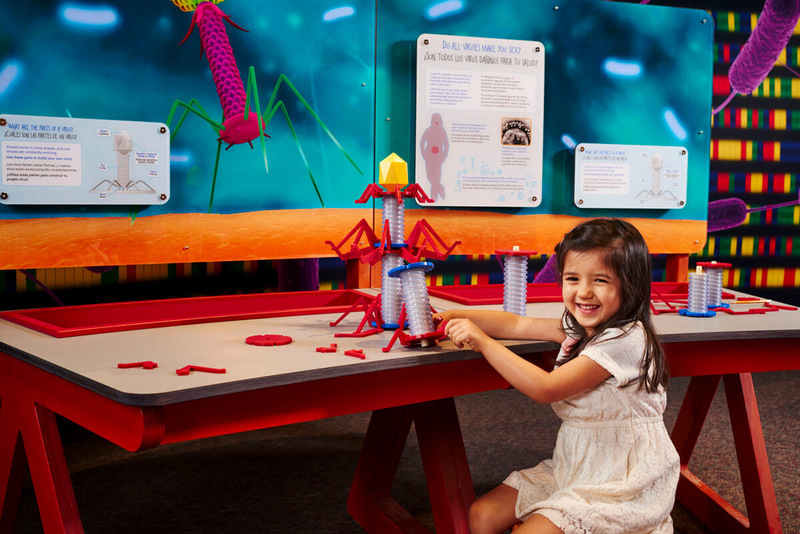 Diagrams explain the parts of the virus and what they do. 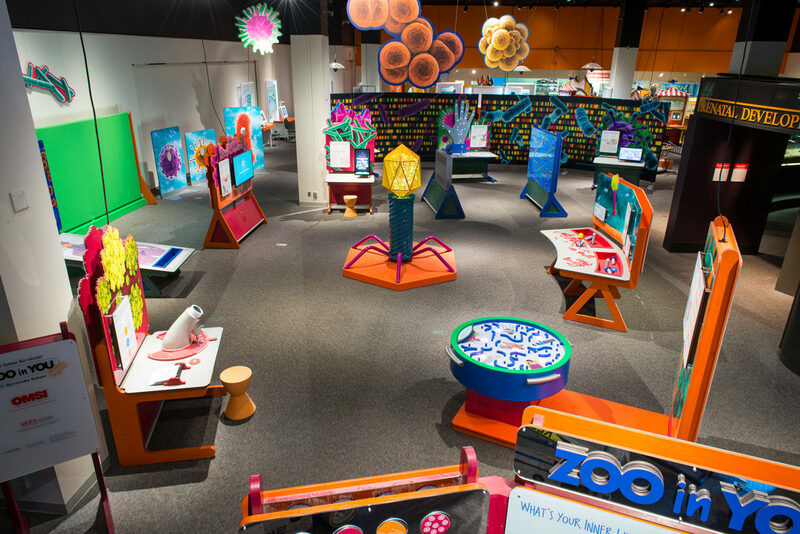 Zoo In You overview featuring colorful environmentals and two exhibit components. This sample floor plan gives you an idea of how Zoo In You will look in your gallery space. 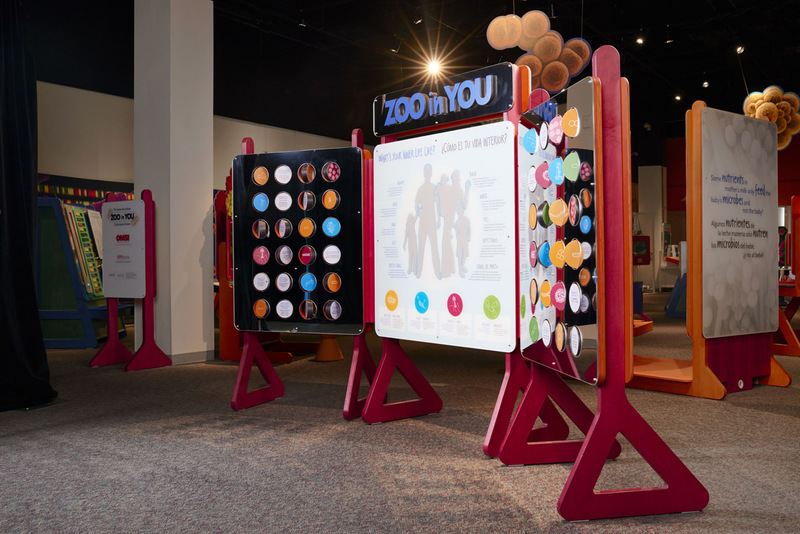 A printable fact sheet about Zoo in You. Tour Schedule for Zoo in You. 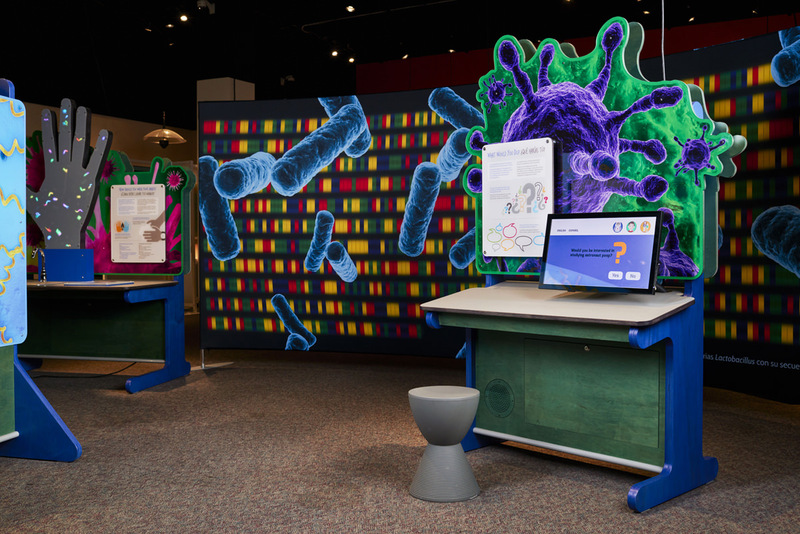 Check out OMSI's Zoo In You website to learn more about the exhibition, the human microbiome, and find additional educational resources. 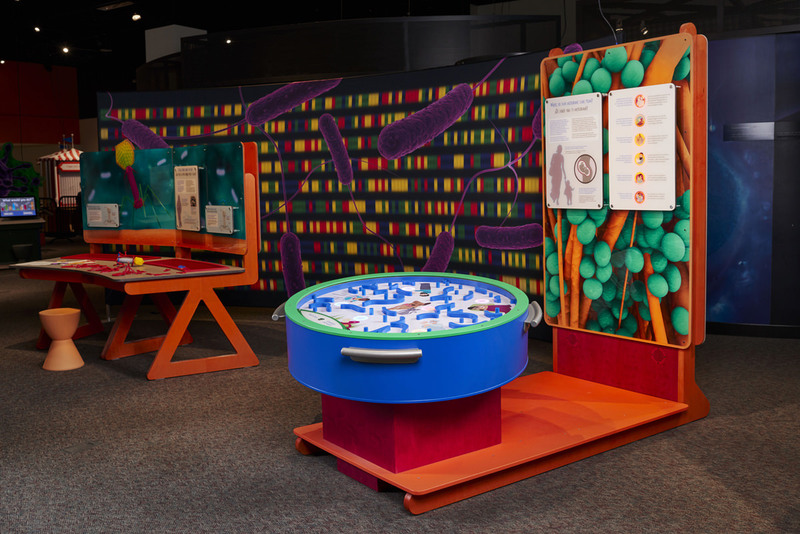 Zoo In You: The Human Microbiome is made possible by an award from the Science Education Partnership Award (SEPA), Project Number 1R25RR032210-01, from the National Institutes of Health (NIH). 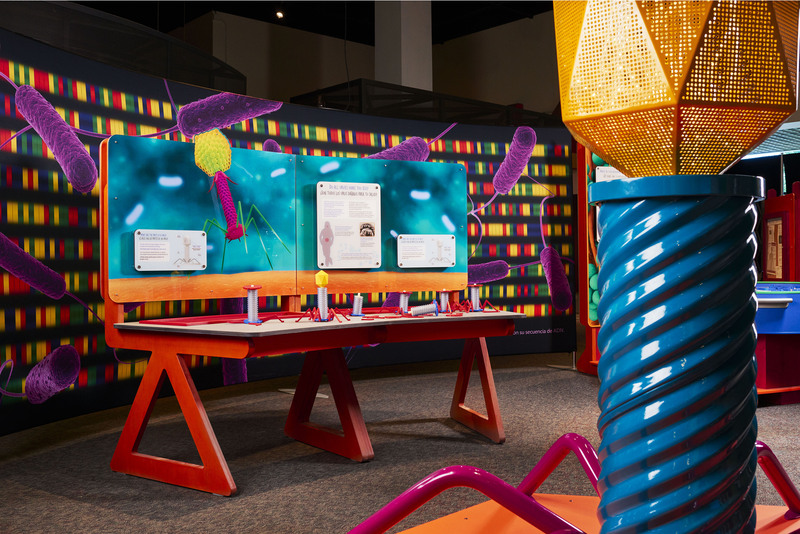 As microbiome research is a technologically complex and rapidly advancing field, OMSI partnered with the J. Craig Venter Institute, a national leader in research on the human microbiome.